Make the season even more festive: Order a poinsettia from the Satellites Auxiliary. The poinsettias range in price from $6 to $16 and are available in an array of colors, including red, white, pink, and blue with gold. The plants vary in size from 4.5 inches to 7.5 inches and by the number of blooms. 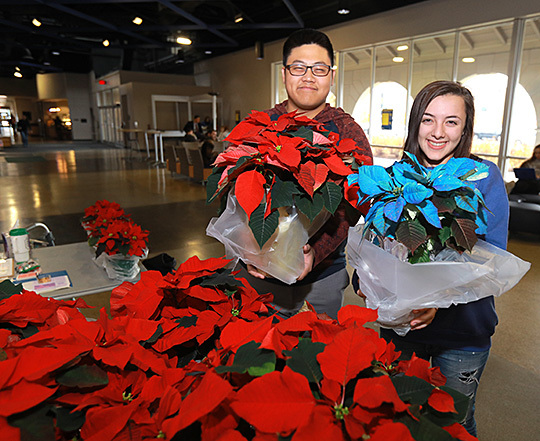 UT students Andrew Yim and Jessica Shippy checked out some poinsettias at the Satellites Auxiliary’s sale last year in Rocket Hall. Fresh wreathes measuring 14 inches also are available for $11. Poinsettia order forms must be received by Tuesday, Nov. 27. Email lynn.brand@utoledo.edu, fax to 419.383.3206, or drop off to Volunteer Services in Dowling Hall Room 75. Orders will be available for pickup from 10 a.m. to 2 p.m. on Main Campus Monday, Dec. 3, in the Rocket Hall Lobby and on Health Science Campus Tuesday, Dec. 4, in the Four Seasons Bistro Atrium. All poinsettias will be foiled and sleeved. Payment is due at the time of pickup; options include cash, checks, and payroll deduction on Health Science Campus. The Satellites Auxiliary is a group designed to promote education, research and service programs; provide support of patient programs in accordance with the needs and approval of administration; conduct fundraising events; and offer volunteer services. For more information on the annual sale, contact Brand at lynn.brand@utoledo.edu. The University provides free influenza immunization for students and employees. Walk-in clinics will be held on Health Science and Main campuses in October and November. Nurses and nursing students will administer the vaccines. 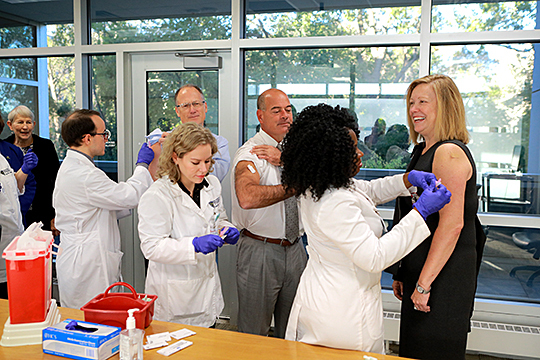 President Sharon L. Gaber, Dan Barbee, chief executive officer of UT Medical Center, center, and Dr. Christopher Cooper, executive vice president of clinical affairs and dean of the College of Medicine and Life Sciences, received influenza vaccines last week on Health Science Campus. Administering the shots were UT nursing students, from left, Zachary Douglas, Stephanie Ruzzin and Taiwo Akinwole. Save time and register at influenza.utoledo.edu before going to a clinic. • Tuesday, Oct. 23 — Health Education Building Lobby from 7 a.m. to 3 p.m. and Pinnacle Lounge from 11 a.m. to 4 p.m.
• Wednesday, Oct. 24 — Collier Building Lobby from 8 a.m. to 2 p.m. and Main Campus Medical Center from 10 a.m. to noon. • Thursday, Oct. 25 — Health Education Building Lobby from 8 a.m. to 1 p.m. and Main Campus Medical Center from 10 a.m. to noon. • Friday, Oct. 26 — Pinnacle Lounge from 7 a.m. to 3 p.m.
• Tuesday, Oct. 30 — Main Campus Medical Center from 10 a.m. to noon. • Wednesday, Oct. 31 — Stranahan Hall Lobby from 8 a.m. to 1 p.m.
• Thursday, Nov. 1 — Savage Arena Lobby from 7 a.m. to 1 p.m.
• Friday, Nov. 2 — Pinnacle Lounge from 11 a.m. to 2 p.m.
• Thursday, Nov. 6 — Pinnacle Lounge from 11 a.m. to 2 p.m.
• Wednesday, Nov. 7 — Health and Human Services Building Lobby from 8 a.m. to 1 p.m.
• Thursday, Nov. 8 — Thompson Student Union Lobby from 8 a.m. to 1 p.m. and Glendale Medical East Main Conference Room from 11 a.m. to 2 p.m.
• Friday, Nov. 9 — Pinnacle Lounge from 11 a.m. to 2 p.m.
• Tuesday, Nov. 13 — Glendale Medical Center from 8:30 to 10:30 a.m. and Academic Services Center on Scott Park Campus from 11 a.m. to 1 p.m.
• Wednesday, Nov. 14 — Eleanor N. Dana Cancer Center from 7:30 to 11 a.m.
• Thursday, Nov. 15 — Pinnacle Lounge from 11 a.m. to 2 p.m.
• Monday, Nov. 19 — Kobacker Center from 11 a.m. to 2 p.m.
• Tuesday, Nov. 20 — Ruppert Health Center from 11 a.m. to 2 p.m.
• Wednesday, Nov. 21 — Pinnacle Lounge from 11 a.m. to 2 p.m.
• Tuesday, Nov. 27 — Pinnacle Lounge from 11 a.m. to 2 p.m.
• Wednesday, Nov. 28 — Pinnacle Lounge from 11 a.m. to 2 p.m.
• Thursday, Nov. 29 — Pinnacle Lounge from 11 a.m. to 2 p.m.
• Friday, Nov. 30 — Pinnacle Lounge from 11 a.m. to 2 p.m. In addition, vaccines will be available at the hospital from midnight to 3 a.m. Wednesday, Oct. 24; Thursday, Nov. 1; Monday, Nov. 5; Wednesday, Nov. 7; Friday, Nov. 16; Monday, Nov. 19; Tuesday, Nov. 20; Monday, Nov. 26; Wednesday, Nov. 28; and Thursday, Nov. 29. Nurses and nursing students will walk the halls and administer shots. Sixty-four University of Toledo faculty members were honored in a special 2018-19 tenure and promotion celebration Sept. 28 in Carlson Library. Last year, 53 faculty members earned tenure and promotion. Each honoree was asked to select a book that was instrumental to his or her success, and these books — each containing a bookplate commemorating the honoree’s milestone — are now housed in the library. “We began this tradition when I joined UT because we believe recognizing faculty helps to foster excellence in research and academics, and helps fuel innovation in all fields of study,” said President Sharon L. Gaber. UT faculty receiving tenure are Dr. Hossein Elgafy and Dr. Xin Wang, College of Medicine and Life Sciences. Appointed as professor with tenure are Dr. Anne Balazs, College of Business and Innovation, and Dr. Raymond Witte, Judith Herb College of Education. 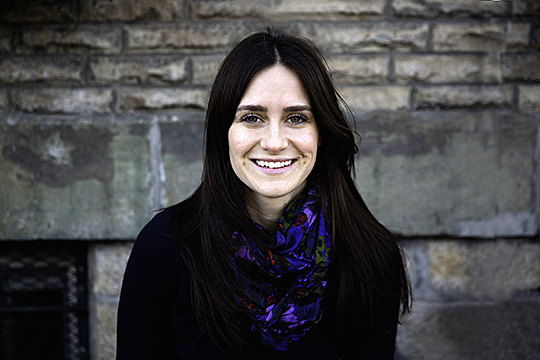 And appointed as associate professor with tenure is Dr. Denise Bartell, Jesup Scott Honors College. Faculty members who were promoted to professor are Dr. Tomer Avidor-Reiss, Dr. Maria Diakonova, Dr. Timothy Mueser and Dr. Michael Weintraub, College of Natural Sciences and Mathematics; Dr. Amanda Bryant-Friedrich and Dr. Frederick Williams, College of Pharmacy and Pharmaceutical Sciences; Dr. Florian Feucht and Dr. Tod Shockey, Judith Herb College of Education; Dr. Bashar Gammoh and Dr. Margaret Hopkins, College of Business and Innovation; Dr. Tavis Glassman and Dr. Sheryl Milz, College of Health and Human Services; Dr. Edmund Lingan, Dr. Mysoon Rizk, Dr. Sujata Shetty and Dr. Jami Taylor, College of Arts and Letters; Elizabeth McCuskey and Evan Zoldan, College of Law; Dr. Azedine Medhkour, Dr. Theodor Rais, Dr. Tallat Rizk and Dr. David Sohn, College of Medicine and Life Sciences; and Dr. Devinder Kaur, Dr. Scott Molitor, Dr. Youngwoo Seo, Dr. Gursel Serpen, Dr. Chunhua Sheng, Dr. Sridhar Viamajala and Dr. Hongyan Zhang, College of Engineering. Promoted to professor with tenure are Dr. Guillermo Vazquez and Dr. Hongyan Li, College of Medicine and Life Sciences. Faculty members who received tenure and promotion to associate professor include Dr. Wissam AbouAlaiwi, College of Pharmacy and Pharmaceutical Sciences; Dr. Halim Ayan and Dr. Eda Yildirim-Ayan, College of Engineering; Dr. Liat Ben-Moshe, Daniel Hernandez, Dr. Jason Levine, Dr. Thor Mednick and Dr. Daniel Thobias, College of Arts and Letters; Dr. Joseph Cooper and Dr. Kainan Wang, College of Business and Innovation; Dr. Rafael Garcia-Mata, College of Natural Sciences and Mathematics; Dr. Mouhammad Jumaa, Dr. Krishna Reddy and Dr. Diana Shvydka, College of Medicine and Life Sciences; and Dr. Aravindhan Natarajan, College of Health and Human Services. Faculty promoted to associate professor are Dr. Daniel Gehling, Dr. Claudiu Georgescu, Dr. Bryan Hinch, Dr. Kimberly Jenkins, Dr. Jeremy Laukka, Dr. Terrence Lewis, Dr. Jiayong Liu, Dr. Sumon Nandi and Dr. Syed Zaidi, College of Medicine and Life Sciences; and Dr. Randall Vesely, Judith Herb College of Education. Faculty who received renewal of their titles with tenure are Michelle Cavalieri and Bryan Lammon, College of Law. And Dr. George Darah was promoted to clinical associate professor in the College of Medicine and Life Sciences. “We wish each of these individuals continued success at the University, and ask our campus community to join us in congratulating them,” Hsu said. Faculty members posed for a photo with President Sharon L. Gaber and Provost Andrew Hsu during the tenure and promotion celebration held last month in Carlson Library. 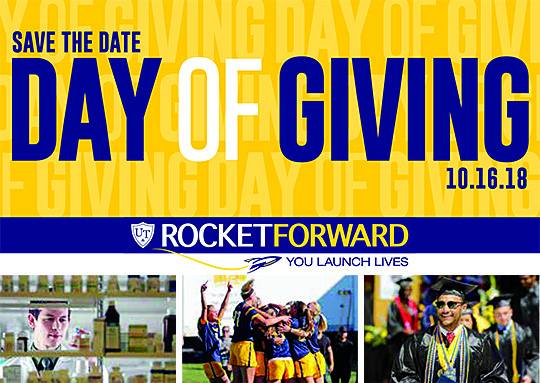 The University of Toledo provides students with so many opportunities for success, and UT’s annual Day of Giving is a chance for the entire campus community to help students reach their goals by giving to Rocket Forward: You Launch Lives. Alumni, faculty and staff members, students and friends of the University who support its mission are encouraged to give during this second annual Day of Giving. The fundraising campaign will begin at midnight Tuesday, Oct. 16, and will last until noon Wednesday, Oct. 17. Every donor and every dollar will make a difference in this 36-hour campaign to raise money for student scholarships, athletic and educational programs, and resources for UT’s academic colleges, among many other areas. Participation is an important goal for Day of Giving, which aims to encourage as many people as possible to support the University. Gift matches and gift challenges are ideal options for making a donation because they double the investment and double the impact. In 2017, an anonymous donor challenged the colleges to compete for Day of Giving participants to support them. The College of Nursing and the College of Arts and Letters led the colleges, garnering the support of 99 and 95 donors, respectively. The colleges also received the additional $5,000 (Nursing) and $4,000 (Arts and Letters) for their progress funds via the donor’s gift. Despite the rain last year on Day of Giving, students, faculty and staff members came out to Centennial Mall for free cupcakes handed out by the president, to hear the UT Rocket Marching Band perform, and to cozy up with some canines at a popular dog-petting station. Multiple activities are planned for Oct. 16 to celebrate the day and raise awareness of the opportunity to give. For early risers, the Student Recreation Center will offer a Rise and Shine cycling class at 6:15 a.m. Oct. 16. With a $5 donation to Rocket Forward: You Launch Lives, you can attend the class, which also will be open to non-members of the center. The UT community is invited to Centennial Mall from 11 a.m. to 2 p.m. Oct. 16 when WXUT FM 88.3 will provide popular music entertainment. Student-run organizations will offer booths featuring carnival-style games. Participants can donate dollars for game tickets, and donations may be made with cash, credit cards and Rocket dollars. Dog-petting will return to this year’s Day of Giving Centennial Mall event, and for a $1 donation you can pet a pup. Foodies can get their fill by visiting three food trucks that will be on the scene: Koral Hamburg, The Leaf and Seed, and Holey Toledough Handcrafted Doughnuts. On Health Science Campus, giving stations will be located in the Collier Building and the Four Seasons Bistro inside UT Medical Center. The College of Nursing will host activities, as well. Click here for a full list of Day of Giving events. Gifts to rocketforward.utoledo.edu during the Day of Giving can be designated to specific funds that support causes donors are passionate about, and there are more than 2,000 funds to support. Support UT Oct. 16 and 17 during its Day of Giving, Rocket Forward: You Launch Lives fundraising campaign, and remember to share messages and encourage others to give using #rocketforward. It’s time to get a flu shot. “Recent news from the Centers for Disease Control and Prevention and the National Foundation for Infectious Diseases that 900,000 people were hospitalized and 80,000 died from the flu in the U.S. last season represents a dramatic increase from past years,” Dr. Susan Batten, UT associate professor of nursing, said. “The loss of life from communicable disease is always tragic; however, there are hidden costs as well. UT students, staff and faculty can minimize the risk for getting seasonal flu by practicing good handwashing and by getting a flu shot, Batten said. The University provides free influenza immunization for students and employees. Walk-in clinics will be held on Health Science and Main campuses in October and November. Nurses and nursing students will administer the vaccines. 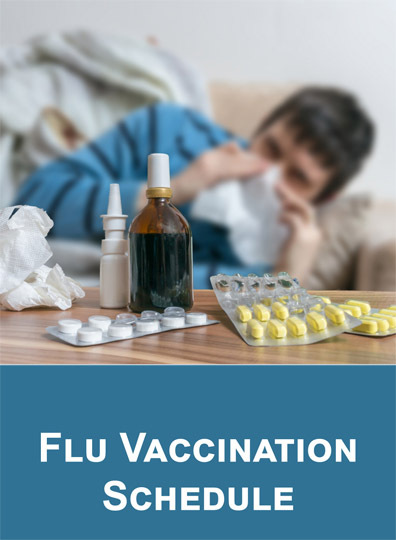 UT Medical Center faculty, staff, students and volunteers not granted a waiver for medical or religious reasons are required to receive an influenza vaccination. Prior to their vaccination, employees must fill out a consent form, which is available at influenza.utoledo.edu. Those who have received flu shots elsewhere also may upload documentation of their vaccination at the same website. Proof of immunization must be received by Dec. 1. Main Campus students and employees can save time and register at influenza.utoledo.edu before going to a clinic. • Tuesday, Oct. 9 — Pinnacle Lounge from 11 a.m. to 3 p.m.
• Wednesday, Oct. 10 — UT Medical Center Gift Shop 7:30 a.m. to 1 p.m.
• Thursday, Oct. 11 — Pinnacle Lounge from 11 a.m. to 3 p.m.
• Tuesday, Oct. 16 — Main Campus Medical Center from 10 a.m. to noon. • Wednesday, Oct. 17 — UTMC third floor from 7 to 11 a.m. and UTMC Gift Shop from 11:15 a.m. to 3 p.m.
• Thursday, Oct. 18 — UTMC Gift Shop 7:30 a.m. to 1 p.m. and Main Campus Medical Center from 10 a.m. to noon. • Friday, Oct. 19 — Main Campus Medical Center from 11 a.m. to 1 p.m.
• Thursday, Nov. 8 — Thompson Student Union Lobby from 8 a.m. to 1 p.m. In addition, vaccines will be available at the hospital from midnight to 3 a.m. Wednesday, Oct. 10; Friday, Oct. 12; Monday, Oct. 15; Friday, Oct. 19; Monday, Oct. 22; and Wednesday, Oct. 24. Nurses and nursing students will walk the halls and administer shots. The University of Toledo is partnering with Bowling Green State University’s Optimal Aging Institute, the Wood County Committee on Aging and the Area Office on Aging of Northwestern Ohio to hold a town hall discussion on how the opioid crisis is affecting older adults and what the community can do to help. 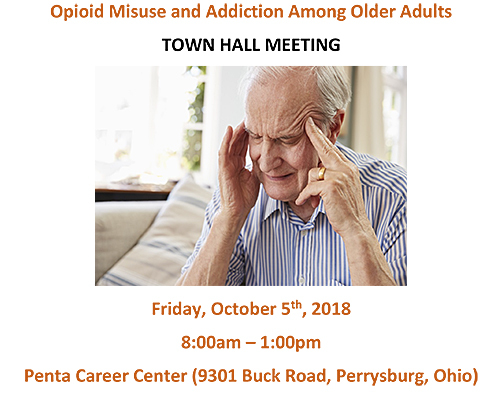 The program, called Opioid Misuse and Addiction Among Older Adults, will be held Friday, Oct. 5, from 7:15 a.m. to 1 p.m. at the Penta Career Center in Perrysburg. Among the scheduled speakers will be Lance Robertson, assistant secretary for aging at the U.S. Department of Health and Human Services. Opioid abuse is often seen as a problem that only affects young adults, but experts say misuse among older Americans is a real and rapidly growing concern. “We don’t think of it as much in older adult populations, and it’s probably not as prevalent, but it certainly is a problem that exists and needs to be addressed,” said Dr. Victoria Steiner, associate professor in the UT School of Population Health and assistant director of the Center for Successful Aging. Overdose incidents among older Americans are rising sharply. Earlier this year, the U.S. Centers for Disease Control and Prevention reported the number of emergency room visits for suspected opioid overdoses among those aged 35 to 54 increased by 37 percent. Among those 55 or older, ER visits were up by 32 percent. More than 44 percent of overdose deaths in 2016 occurred in those 45 and older, the CDC reported. Beyond overdoses, there are other unique concerns related to prescription opioid use in older populations. Topics to be addressed at the seminar include warning signs that older adults may be suffering from opioid addiction; examples of situations that increase the risk for abuse or addiction; evidence-based pain management in the era of the opioid crisis; and public policy and resources for health-care professionals who work with older adults and their families. “Older adults are interfacing with so many different health-care professionals and our hope with this Oct. 5 presentation is to bring in all these providers so they receive the same prevention education messages and recognize the importance of assessing opioid use and misuse,” said Dr. Nancy Orel, executive director of research at BGSU’s Optimal Aging Institute and interim chair of the Department of Human Services. To register for the free, public event, call the Wood County Committee on Aging at 419.353.5661 or email oai@bgsu.edu. The event does not offer continuing medical education credits. Faculty members at The University of Toledo were awarded $1.3 million in federal grants for projects related to opioid abuse, mental health, cancer and antimicrobial technology. Dr. Cheryl McCullumsmith, professor and chair of the UT Department of Psychiatry, was awarded a three-year, $449,076 grant from the Center for Substance Abuse Treatment to expand education about opioid use disorder across all disciplines within UT’s College of Medicine and Life Sciences. “The College of Medicine and Life Sciences will equip all medical students with the knowledge and the skills they need to appropriately manage opioid treatment and confidently identify opioid use disorders, regardless of their planned specialty. We are training a generation of family medicine doctors, surgeons and internists to actively prevent and treat opioid use disorders,” McCullumsmith said. Dr. Linda Lewandowski, dean of the UT College of Nursing and co-chair of the UT Opioid Task Force, was awarded a three-year, $371,723 grant from the Substance Abuse and Mental Health Services Administration for an interdisciplinary public health project that will provide evidenced-based mental health awareness training to UT students, faculty and staff, as well as the wider northwest Ohio community. The training includes appropriate responses, materials on available community resources, and information about the unique mental health needs of active-duty military and veterans. The program is built with a specific emphasis on issues related to the opioid epidemic. “With one in five Americans experiencing mental health problems in a given year, it is more likely that an individual will come across someone having an emotional or mental health crisis than someone having a heart attack. By providing ‘mental health first aid,’ we will empower our students, faculty and community to recognize mental health and substance abuse problems and respond appropriately. This type of training is especially important during this time of the pervasive opioid crisis affecting our state and the nation,” Lewandowski said. Dr. Maria Diakonova, professor in the UT Department of Biological Sciences, was awarded a three-year, $449,667 grant from the National Institute of General Medical Sciences to focus on a protein called JAK2 as she works to identify new drug targets to reduce the risk of cancer. “Our goal is to explain the JAK2-mediated intracellular pathways and have a better understanding of the mechanisms involved in cell proliferation, or cell division, which could provide insight into future therapeutic approaches to cancer,” Diakonova said. Dr. Terry Bigioni, professor in the UT Department of Chemistry and Biochemistry, was awarded a $50,000 grant from the National Science Foundation to research broad-spectrum antimicrobial coatings for garments and textiles. Antimicrobial treatments are already used in medicine as anti-infective treatments and in garments and textiles for odor control. This technology could bring odor control to a wider range of products and reduce the need to launder many garments, improving garment lifespan and reducing their environmental impacts. “We think our antimicrobial technology could bring a lot of added value to the garment and medical industries and create new manufacturing jobs right here in northwestern Ohio,” Bigioni said. 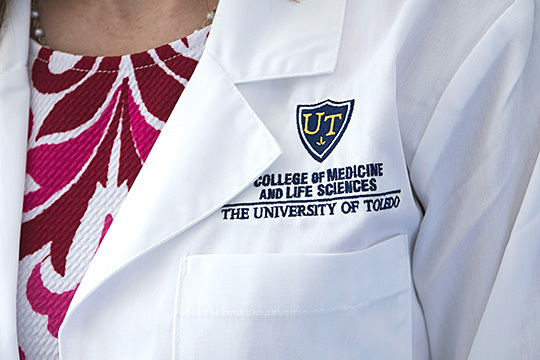 The University of Toledo College of Nursing and ProMedica today announced an expanded partnership to bolster nursing education and address current and future health-care industry challenges. The planned partnership between the UT College of Nursing and ProMedica will focus on enhancing undergraduate and graduate nursing education and high-quality care while developing a clinical nursing workforce to help meet current and future health-care needs in ProMedica’s local, regional and national service areas. According to the Bureau of Labor Statistics, the United States is expecting 1.2 million job position vacancies for registered nurses by 2020. The UT College of Nursing provides nursing education programs responsive to the changing needs of students and the health-care environment. UT’s nationally ranked master’s and Doctor of Nursing Practice Program include a range of specialties, including adult gerontology primary care, pediatrics and psychiatric mental health. UT’s Post-Baccalaureate Doctor of Nursing Practice Program was the first such program in the state to take nurses to the highest level of clinical practice and position them as leaders in the health-care field. Through this partnership, ProMedica and UT will collaborate to develop innovative educational programs, diverse clinical experiences for students, interprofessional research collaborations and high-quality professional development programs to improve health care in our community. Additionally, the partnership will work to advance the nursing profession and health care by supporting the development of local, state and national policies.